Be a Ghost Hunter for a night while also aiding in the preservation of history. 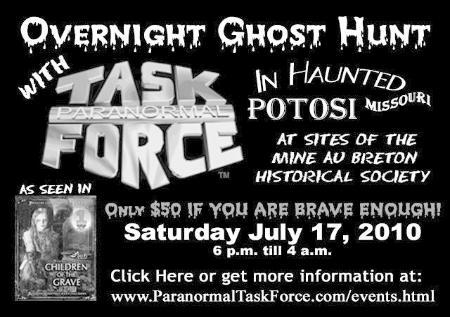 Come investigate the historic and haunted properties of the Mine Au Breton Historical Society n Potosi, MO on Saturday July 17, 2010 with PTF. * Private Ghost Hunt with Greg Myers and Investigators from PTF. - Note - An "at your own risk" liability waiver will be required to be signed by attendees. Paranormal Task Force and the Mine Au Breton Historical Society reserves the right to refuse admittance to anyone and to remove those who are disruptive to others. There is also no guarantee that anyone will witness or experience paranormal activity at this event. BUY IT HERE NOW! Click on the cover art above to order your copy now! PULP WINDS, the long-awaited collecton of short fiction, verse, and Forteana by TGS author Wm. Michael Mott, has been unleashed for mass consumption! With introductions by Walter Bosley, Brad Steiger, and Gerald W. Page, these tales will take you from the antediluvian world to lost cities beneath the earth, onward to other planets around distant stars, and even to the Dark Ages, the Old West and the High Seas. New twists on mythos and madness are intermeshed and presented in these yarns of terror and adventure! 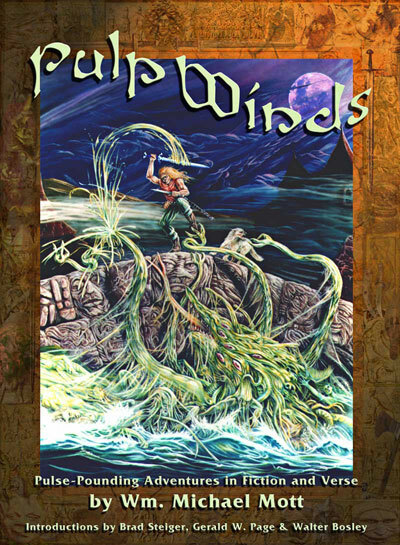 Profusely illustrated, and reminiscent of pulp fiction and verse of a bygone era, PULP WINDS is a literary adventure of a type scarcely seen today! These literary gems are not in the modern vein of politically correct, emasculated tales of slow pace and boring introspection so common today, but are fast-paced, pulse-pounding accounts of action, horror, love, hate and gore! Presented in a large-format for easier reading and for viewing of the artwork, the design is reminiscent of the pulp magazines of an earlier, bygone era. Those of you familiar with Mott's non-fiction Fortean research will find familiar themes from the realms of the unknown interwoven into, through, and beneath these stories, like the currents of a deep black subterranean river of mystery, glimpsed and occasionally revealed in all its weirdness and terror, before plunging beneath the surface again. 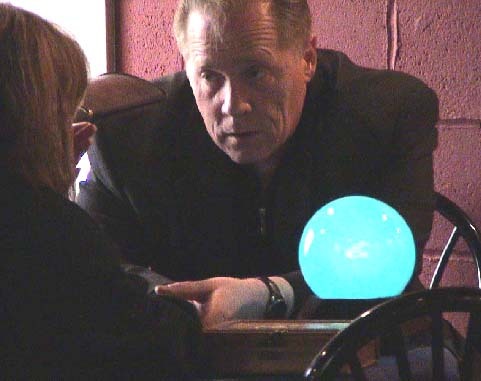 Also included is an article on Fortean matters along the lines of the research presented in Caverns, Cauldrons, and Concealed Creatures, Mott's definitive non-fiction opus on high strangeness, hidden beings, and real-life mysteries. 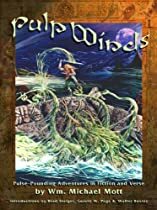 Some of the stories and poems in PULP WINDS have also appeared in Lost Continent Library Magazine, Planetary Stories, and elsewhere, but have never been gathered together into a single collection before now. If the reader finds occasional hints of the Apocrypha, the Pseudepigrapha, the Book of Skelos, the Eltdown Shards, the Necronomicon, and yes, even the mad musings of the Shaver Mystery in these tales... It is no mere happenstance! BLOOD AND THUNDER has returned to the literary realm. PULP WINDS will satisfy your cravings for fast-paced, haunting adventures across time and space! Click on the cover art above to order your copy now! Wm. Michael Mott is also one of the wonderful featured award winning Artist in Brad Stingers' New "NUMBER 1 Best Seller!"